On-site test kits have come a long way. 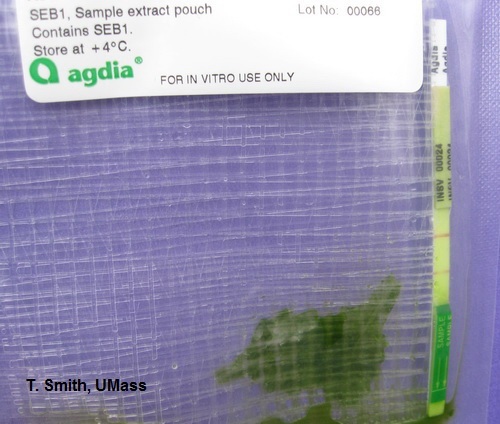 Test kits are easy to use and are available for several diseases (viruses, fungi and bacteria) important to floriculture crops. Growers should consider stocking up on a few test kits for the spring growing season. Test kits will confirm your disease diagnosis, allow you to detect diseases early, provide you the option to treat only when necessary and use the proper management for the disease. As a result you will maintain good crop quality. Easy to use ImmunoStrips (dip-stick tests) are available from AgDia to detect viruses such as Impatiens Necrotic Spot Virus (INSV), Calibrachoa Mottle Virus (CbMV), Tobacco Mosaic Virus (TMV), Tomato Spotted Wilt Virus (TSWV),and Cucumber Mosaic Virus CMV) to name a few. There is also a combination kit for INSV and TSWV. 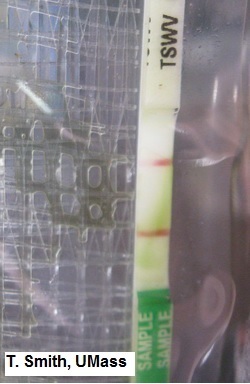 Immunostrips are also available for several important bacterial pathogens such as Xanthomonas campestris pv . pelargonii, Ralstonia solanacearum and Clavibacter michaganensis subsp. michiganensis . Alert kits from Neogen Corp. are available for Pythium, Phytophthora, and Rhizoctonia. Each company has kits that are used a little differently, however the same principal applies. Tests are based on antibodies that are designed to recognize antigens specific to each pathogen (ie. INSV). Any antigen present in the plant sample is extracted by grinding in the extraction solution. The extracted antigen is then allowed to react with antibodies that capture specific antigens (when present). Early detection and success using test kits are only as accurate as the sample taken. For example, if a plant has symptoms of INSV, a quick test will confirm your suspicions. Collect a sample from the part of the plant showing symptoms, including green or chlorotic tissues adjacent to the necrotic area. 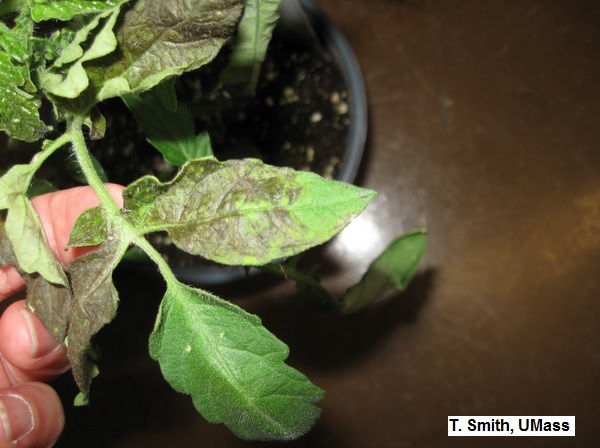 Even, when plants are systemically infected, INSV does not spread evenly throughout the plant, so careful selection of tissues is crucial to the success of the test. Not every company carries kits for all diseases. Note: Kits need to be refrigerated and expiration dates observed. See the fact sheet "Western Flower Thrips and Tospovirus" . Thanks to Dr. Rob Wick, Dept. Stockbridge School of Agriculture for reviewing this article.